Global high-throughput satellite market (capacity revenue) generated a revenue of $3,466 million in 2017, with broadband application holding the highest share. 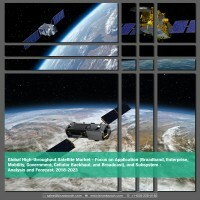 The global high-throughput satellite market has exhibited a high growth in the recent past. Currently, the space industry is at the cusp of a major revolution, as a large number of HTS are expected to be launched in the next five years. The HTS market has witnessed a high growth rate owing to the growing need for network connectivity, rise in the demand for high-throughput satellite constellations, and increase in the deployment of high-throughput satellites for commercial end users. The recent innovations in satellite equipment and services enable the HTS technology to reach a wider segment of consumers in the industry. HTS deliver much higher capacity than do traditional satellites at a mere fraction of the cost. This is made possible because HTS are based on spot beam technology, which enables frequency re-use across multiple narrow-focused spot beams. High-throughput satellites offer unique advantages and have a huge potential to serve various application areas such as enterprise network, government, and cellular backhaul, among others. • This report identifies the global high-throughput satellite market in different segments, such as application, payload, and region. • The study talks about the prime supply side factors affecting the growth of the market along with the current and future trends in the high-throughput satellite market. • The study also presents a detailed assessment of the high-throughput satellite market along with market drivers, challenges, and growth opportunities. • The report also highlights the value chain of the overall high-throughput satellite industry. • A detailed competitive analysis has been included in this report, which focuses on the key market developments and strategies followed by the major players in the market. • The high-throughput satellite market is also analyzed on the basis of different applications such as broadband, mobility, enterprise, government, cellular backhaul, and broadcast. • In this report, various subsystems of the high-throughput satellite market have also been studied. The subsystems include payload, structure, telecommunication, on-board computers, power system, attitude control system, and propulsion system. • The high-throughput satellite market has been analyzed for all the regions including North America, Europe, Asia Pacific, and Rest-of-the-World with further analysis with respect to several major countries in the region. • The key market players are analyzed in the Company Profiles section of the report. This section covers the business financials, company snapshots, key products & services, major developments, and the individual SWOT analysis. Figure 8.10 SWOT Analysis: Eutelsat S.A. Figure 8.27 SWOT Analysis: Orbital ATK, Inc. Figure 8.32 SWOT Analysis: SES S.A.
Satellite technology has evolved over the past 60 years since the inception of the technology from the government-funded projects to commercial ventures. The space industry is filled with a series of space missions, which utilize resources to create value and benefit society, globally, in terms of understanding, exploring, researching, managing, and utilizing space. Telstar was the first private sector communication satellite, which transmitted voice, television, and data between the U.S. and the Europe, thus opening space to the commercial end users. The technological advances in the payload of a satellite have drastically reduced the cost per bit to the end users. One such advancement is the development of high-throughput satellites (HTS) that transmit 20 times more data than do conventional satellites. HTS deliver much higher capacity than do traditional satellites at a mere fraction of the cost. This is made possible because HTS are based on spot beam technology, which enables frequency re-use across multiple narrow-focused spot beams. The HTS market has witnessed a high growth rate owing to the growing need for network connectivity, rise in the demand for high-throughput satellite constellations, and increase in the deployment of high-throughput satellites for commercial end users. The high-throughput satellite market is developing significantly and much of this has been attributed to the rapid technological advancement in this field. Global high-throughput satellite market is segmented into six types: broadband, mobility, enterprise, government, cellular backhaul, and broadcast. Consumer broadband dominated the global high-throughput satellite market (capacity revenue) in 2017. The growing need for the data connectivity across the globe is the reason behind the biggest market share of consumer broadband. During the forecast period, mobility market is expected to grow at a faster rate in comparison with the other types. The growing need for the inflight and maritime connectivity is the major factor driving the high growth. North America, followed by Latin America, Asia-Pacific, Middle East and Africa, and Europe is expected to dominate the market during the forecast period (2018-2023). The United States is the leading country in the global high-throughput satellite market, and the country is expected to maintain its dominance during the forecast period. Asia-Pacific is expected to grow at the highest CAGR, with Indonesia dominating the market in this region. This region is growing at a much faster rate as compared to the North America and Europe due to continuous efforts by both the government and the high-throughput satellite operators. Some of the key players in the high-throughput satellite market include: Airbus Group SE, Eutelsat S.A., Hughes Network Systems, LLC, Inmarsat, Intelsat, Orbital ATK Inc., SES S.A., Space Systems Loral, Thales Group, and The Boeing Company.